Readers who are familiar with the big Best of ATTACK! and National Vanguard tabloid-sized book will recognize the image and its caption, above, from page one of that volume. I remember doing Google image searches for Before and After in the past and not finding anything. I’d never seen this “anti-Semitic” image anywhere else except in the BANV until recently in another Google search. 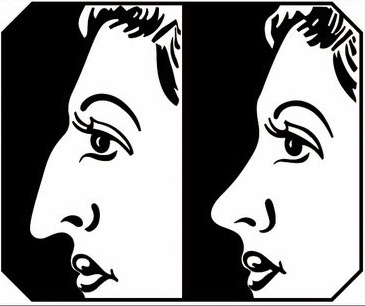 The painting was executed by Warhol in 1962 . . .
Continue reading Andy Warhol’s Jewish Nose Job . . .
Then he did something strange. As the men watched curiously, Travis drew his sword and traced a line in the dust along the front of the first rank. Now . 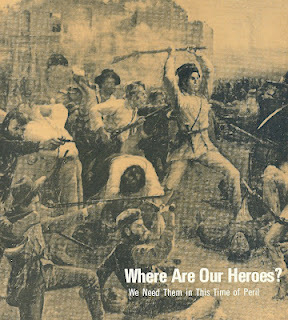 . .
Continue reading Where Are Our Heroes? . . .
DURING TIMES OF SOCIAL DECAY and turmoil, the more responsible members of a society will nearly always be found supporting the constituted authority against the hostile or rebellious actions of disruptive elements. For the truly responsible and prudent citizen takes the long view, and he sees (in the words of the Founding Fathers) that governments long established should not be changed for light and transient causes; that, however grievous may be the defects in any governmental policy or even in any system . . .
Continue reading Why Revolution? . . .
A. In a sense, nearly all of them are, surprising as that may seem at first. They are in the pay of the Enemy . . .
Continue reading Why don’t more respectable, successful, influential White community leaders help our noble cause, Dr. Pierce? . . .